Managing Director, South Asian Liver Institute. 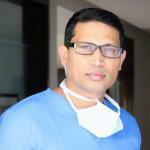 National Director, HPB Surgery & Liver Transplantation, CARE Hospitals India. Professor (GI Surg), Nizam’s Institute of Med Sci (NIMS), Hyderabad. Dr. Tom Cherian is a Liver Specialist with expertise in complex (Split, Domino, Auxiliary) Liver Transplants & has even innovated pediatric transplant techniques. His career following medical qualification, included 3 years of basic surgical training, when he received his FRCS (MS Equivalent); He was then selected for Higher Specialist Training in HPB and transplant surgery at Birmingham (UK) when he obtained his sub speciality FRCS (M Ch Equivalent). At that time Birmingham was the second largest liver transplant unit in Europe. In 2008 he received his Certificate of Completion of Specialist Training [CCT] in London. On finishing his training he worked as a senior surgeon for 5 years at King’s College Hospital, London – the world’s top liver institute before moving back to India. By this time cumulatively, he had received 17 years of surgical training and experience in the UK, 10 years of which was at two of the “World’s top 5” liver hospitals. British Journal of Surgery Prize paper session speaker (2007 & 2008). Clinical tutor and MD Examiner. Universita di Pisa, Italy. Invited International Speaker in >12 countries (USA, Stockholm, Paris, Austria). Member of Registry Committee, Intl Liver Laparoscopic Society (ILLS), Paris. 2017. Founder & Managing trustee, THE LIVER FOUNDATION. A charitable trust. Founder & Chief Editor, LIVERIMAGE. A web-based tool for liver surgeons, whose editors include some of the world’s top liver surgeons. Only website for Top International reputed Liver surgeons to share knowledge. Senior advisor (Telangana State) for Liver Transplantation, since 2014. Dr. Tom Cherian performed the 1st successful liver transplant in several key government hospitals – GB Pant Hospital, New Delhi; Osmania Hosp, Hyderabad; NIMS, Hyderabad. Conducted the 1st Successful SPLIT liver transplant in Combined Andhra States, in Hyderabad in 2015. Published an international paper on a successful innovation in Pediatric liver Transplantation, from Hyderabad.